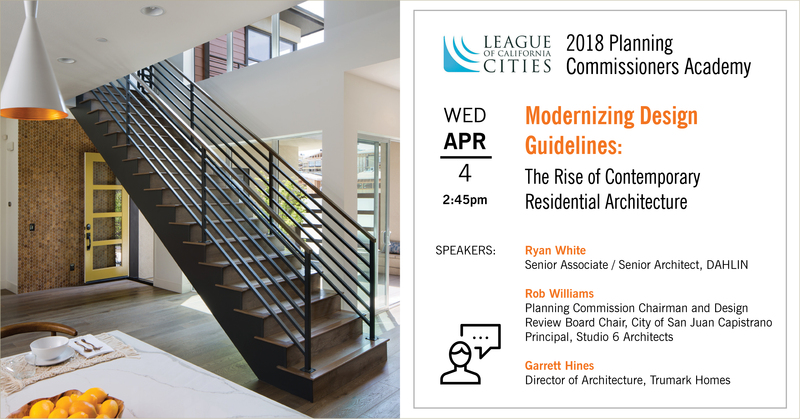 DAHLIN will be presenting on Modernizing Design Guidelines at the 2018 League of California Cities Planning Commissioners Academy along with Trumark Homes and City of San Juan Capistrano. The rise of transitional design – a blending of traditional and modern styles that gives a fresh take on familiar forms – is mainstreaming contemporary-styled homes as it moves from the interior to the exterior. Between 2014-2015, the AIA Home Design Trends Survey charted a seven-percent increase in both the popularity of contemporary-styled homes and of simpler exterior detailing, but most municipal design guidelines pre-date these trends – inadvertently creating conflict between what is allowed and buyer preference trends. Panelists will discuss these trends, show examples, and provide strategies for municipal leaders to modernize design guidelines without compromising the character of their cities.